Over the years I've caught most of my salmon while standing either in a river or on a beach—I'm just too much of a cheapskate to hire a charter. Last week, though, with Hank and Holly in town, I took a rare opportunity to fish for salmon while standing on a boat. Here's the funny thing: I was standing on a boat within sight of a public beach where I sometimes stand with rod in hand for free. But don't get me wrong: the action was all offshore. 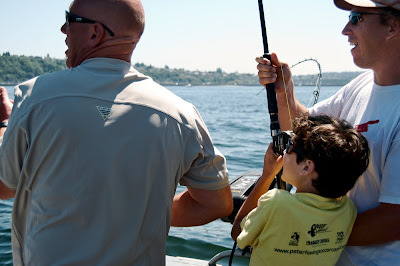 The boat was a charter out of Shilshole Marina in Seattle operated by Captain Nick Kester of All Star Fishing Charters and the beach was Golden Gardens. Though I didn't actually get a chance to hoist a rod myself, I watched my boy reel in the first of two silver salmon, which was even better. Just a week before, Riley was building sand castles with his sister a few hundred yards to the east from where we were now trolling flashers and cut-plugged herring. Most of the year the parking lot at Golden Gardens is near empty, but on sun-splashed summer days the park's sandy waterfront overflows with Seattlites determined to experience the novelty of a day at the beach. I guess I was a little surprised to find out that more than a few salmon charters work the rips right off that beach, too. The upside of a charter is that your chances of catching fish are about as good as they get; the downside is that you'll be catching those fish with the aid of down-riggers, which means you're mostly reeling. At first Riley was baffled by this unfamiliar setup. After the first rod popped and he was called to duty, he saw the plus side. It's a fact that a guided charter using down-riggers and fishfinders takes a lot of guesswork out of fishing—and it's also a fact that the live-wire excitement of having a salmon on the line increases exponentially on most days with such advantages. 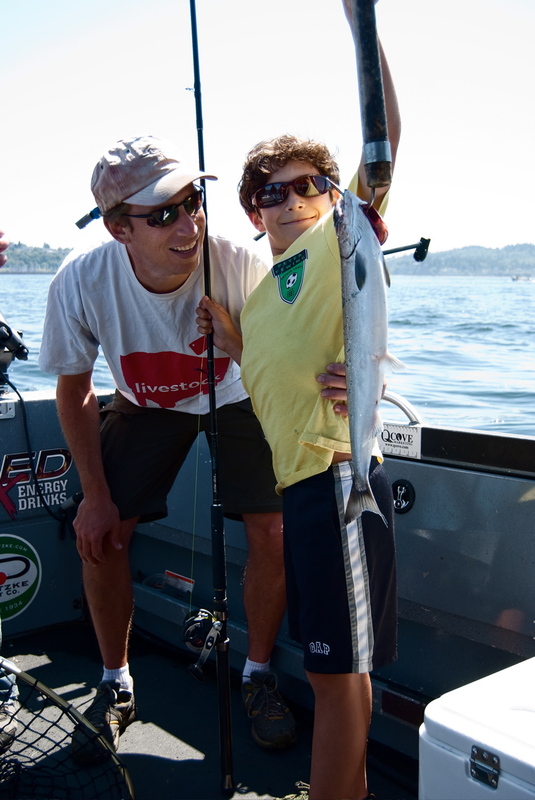 Resident silvers (aka coho, Oncorhynchus kisutch) are fish that never leave Puget Sound. They hatch in local rivers, rear in the Sound, and return to those same rivers to spawn. While in the Sound they dine on a diet of amphipods and small bait fish, rarely attaining the size of silvers that leave the Sound altogether for the wilderness of the North Pacific. Those silvers, sometimes called "ocean hooknoses," can be much larger, with the males displaying deeply kyped jaws. A devoted band of saltwater fly-fishermen pesters the resident silvers for most of the year. Just about any point of land sticking into the Sound can be a possible fly-fishing spot when a combination of tides and currents brings the feeding fish close to shore. The Tacoma Narrows in particular, with its fast-moving currents, is a place where anglers gather to cast from the beach. In spring the resident silvers are trout-sized; as the summer wears on they put on weight and look more like salmon fit for a barbecue, albeit on the small side; by early fall the fish are in a feeding frenzy, a last-ditch effort to fatten up before the spawn. This is when most beach fishermen seek them out. By then the resident silvers are about as big as they'll get, usually in the four or five-pound range, and the ocean silvers are just arriving, giving the angler a shot at a 12-pounder. To be honest, fishing for resident silvers with all the advantages of boat, down-rigger, and bait felt a little dirty. In retrospect we probably should have asked the captain to motor a dozen extra miles out to the chinook grounds, where the fish and tackle are more suitably matched. But like a good captain, his first concern was getting his clients—which numbered two Californians prohibited by law in their own state from fishing depleted stocks of silvers—into fish. 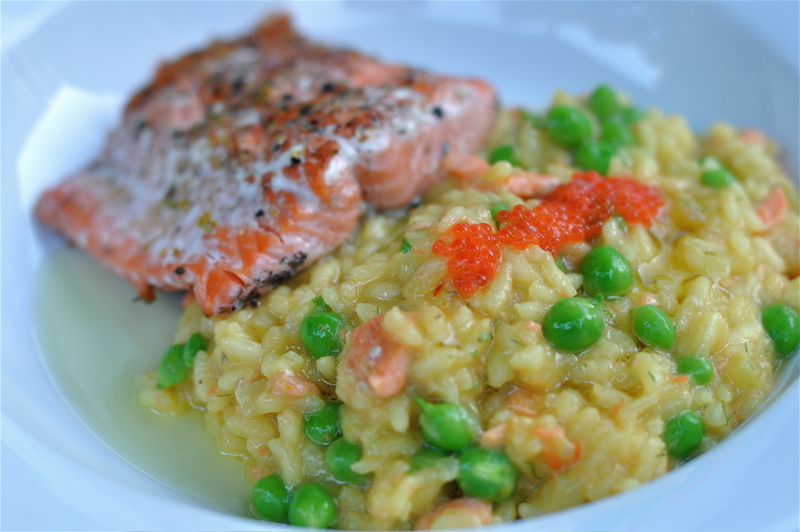 That night we ate grilled salmon over risotto in nose-to-tail fashion. Meat from the salmon cheeks went into the risotto, as did the roe. The carcasses made a wonderful broth, some of which we used for the risotto while the rest went into the freezer. Hank had some very nice saffron on hand to tart up the risotto along with white wine, Walla Walla sweet onion, English shelling peas, and lemon zest. A fitting feast after a good afternoon on the water. Photo at top and second from top by Holly Heyser. Great post! Very informative. The pictures are nice too. Looks like you had fun, and ate a great meal! I read your posts about fishing and clam digging and I'm so jealous. I've convinced Hubby we should try fishing ourselves and he's agreed. Mind you, we both haven't fished since we were kids, so this is going to be interesting. Luckily, we have a friend who knows about fishing and is willing to take us out. I'm so excited! Sounds like fun, but... If you ate the Silver the night you caught it, you were about three days too early. It would have still been in Rigor Mortis, which makes a salmon tough and strong flavored. This also applies to freezing; should let them relax first. 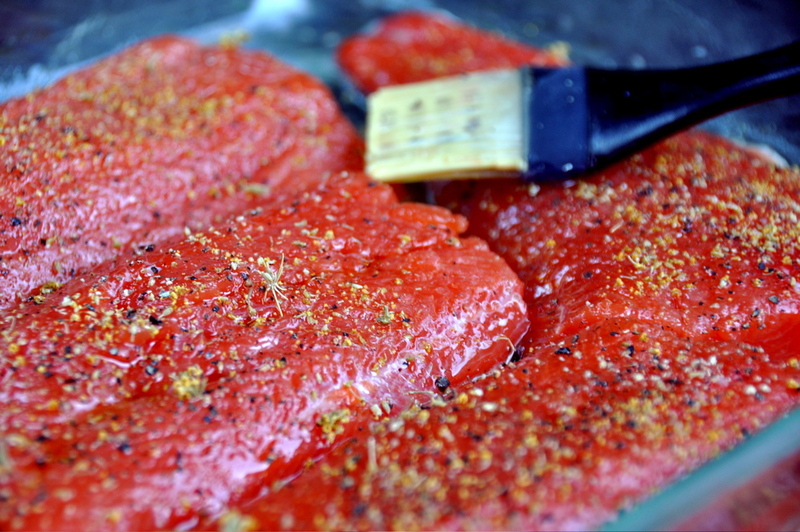 Rigor usually goes after a day or so, flavor improves over the next couple days. Emily - Thanks, it was a very good meal with good company. adalynfarm - I'll be going out with All-Star again fer sure. dp - Good on ya! Report back on your fishy progress. PTjim - I dunno, they were pretty darn tasty. I'll look into your thoughts on fish cookery for a future post, thanks.